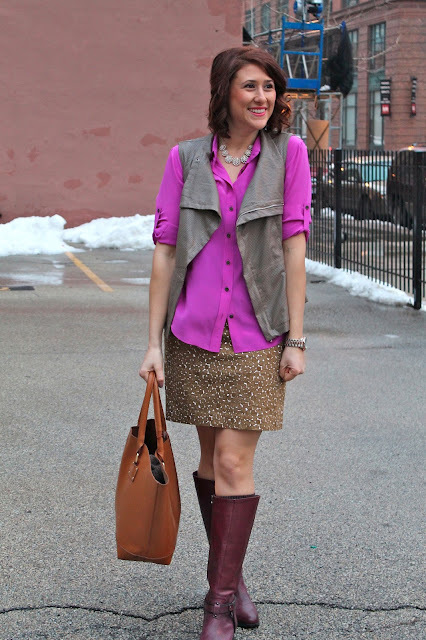 I was inspired when watching Glee this week when I saw Rachel Barry wearing a bright purple blouse with a polka-dotted skirt that appeared to be green. I had the pieces to replicate it, but I felt it needed more, so I added this Akira faux-leather vest, mostly for warmth. And since I couldn't get a glimpse at her shoes I was left to decide that on my own, so I went for my oxblood boots. It's a prefect example of an outfit that doesn't necessarily match, but still works. Pink and neutrals definitely work! I haven't watched "Glee" in a while and need to catch up! See you sonn and one big kiss! so cute! I adore the color of your blouse!